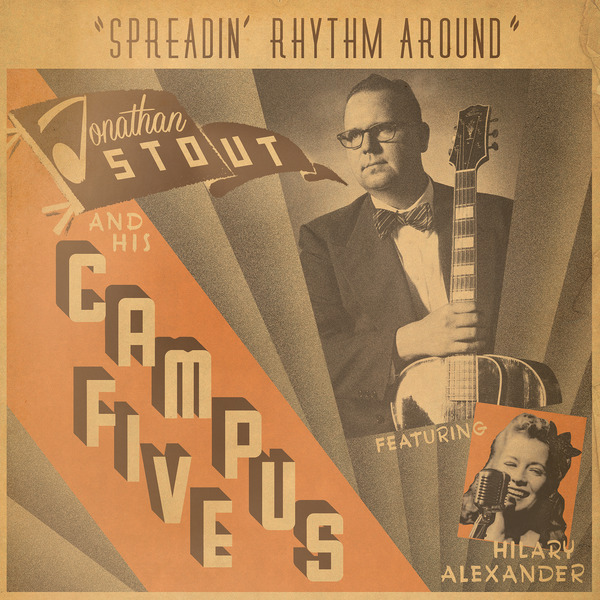 As the holidays approach and you're looking for something to get the guitar players in your life (or get yourself! ), here's some suggestions, along with some thoughts about the sublime, yet somewhat ridiculous, universe of guitar picks. If you look through online discussion forums, or youtube video reviews, there is a lot time spent discussing picks. On the one hand, the guitar pick itself is an incredibly small part of the equation, and they are essentially fungible, on the other, they can be a very important part of one's tone and playing technique. Just like every other part of one's tone chain, from the strings, to the setup, to one's instrument, to the amplification (if any), they can make all the difference, and yet are often never the magic bullet. I've spent the better part of 14 years trying to figure out the "perfect" guitar pick for Swing Guitar. At first, when sheer acoustic volume was the top concern, the revelation that was the 5mm Wegen Fatone was such a giant leap over the alternatives (Big Stubby's and the like) that it was like we'd all found the secret. Even John Reynolds was using one and singing it's praises. Over the course of the next 8 or so years, I experimented with all many variations, including Red Bear, the Wegen Button, and even the gigantic 7mm Wegen! Toward the end of that phase I started tapering down, from the 5mm Wegen to the 3.5mm, and eventually to the 2.5mm. My observation at the time was that what the small picks lacked in sheer volume, they made up for in clarity of tone. Eventually, I found myself in possession of a real tortoise-shell pick, repurposed from an antique of some kind. The quality of tone was significantly different than anything I'd used before, and I recognized it as the perfect blend of clarity and warmth. Of course, since this was a rare thing to have, there weren't "options" as to the thickness or shape, and since it was maybe a 1mm pick at most, it did begin to warp slightly with general use. At this point I made yet another valuable observation: what sounds or feels best in one context is not necessarily what sounds or feels best in another. I tried using the tortoise pick on gigs, and sometimes it did not have sufficient thickness or stiffness to project in the given situation. Now, perhaps proper monitors would have been better than changing the pick, but we're not always in control of things like that. In cases where I needed to dig in more, I found myself switching picks to something heavier. By now, I'd slimmed down to the 1.2mm Wegen from the 1.4mm Wegen, and had picked up several faux-tortoise alternatives which I was testing out. But then came yet another revelation: the magic of a proper guitar setup. I've written about this here before, but having my guitar truly and properly set up was life-changing. I had always assumed that very high action was necessary for sufficient acoustic volume and response. Consequently, you might need a thicker pick to wrangle such high strung strings. But, having a guitar that finds the perfect balance between projection and playability, allows one to play with better technique, less effort, and better, purer tone. This shift again had me re-evaluating picks. I started trying out anything I could, just to see if it would sound good. I noticed fascinating differences between the tones each pick would produce. Even the difference between a standard Fender Heavy to a similarly sized Dunlop of various materials was noticeable if you were listening. Surprisingly, I noticed that the StringsandBeyond.com generic Heavy pick had a tone that, on my Franken-150, reminded me distinctly of Charlie Christian. Who knew, right? There was just some magic combination of thickness, material and bevel that had a similar character. But those really are the big three factors determining the tone of a guitar pick: material, thickness and tip shap/bevel. Harder picks, thinner picks, and sharply pointed or beveled picks were all brighter in different ways. Softer, thicker picks with a more rounded tips and bevels were all warmer. However, each factor changed the character in different ways, almost at different frequencies - so dialing in the perfect pick was finding a balance of all the factors, along with finding a pick that felt comfortable in your hand and either bent or didn't bend according to your preferences. When a pick starts to bend, it feels like a flat tire to me - essentially acting as a limiter: no matter how much harder you pick, you get no additional volume. I'm sure somebody out there enjoys the flex of thin or medium pick, but definitely not me. Add to that last point about flexibility, the fact that the final variable is your sound in the room/amplification. If you can't hear yourself well, and the pick is giving in, you will end up picking super hard with nothing to show for it. Giant Wegens: I still have one of each in my gear bag, just in case. I'm sure there might be a situation at some point where I might need the big ones to get through the gig, but for normal playing they are too much. Like cranking the action unnecessarily high, they end up just bashing the strings. Also, since they hit so hard, you kind of need higher action to keep them from mashing the strings into the fretboard and buzzing. Red Bear: The high cost and custom nature of these picks makes them something I skip over. They ARE awesome picks, but it's almost impossible to experiment to find the right one. D'Andrea Pro-Plec: Faux-tortoise from the company that invented the celluloid guitar pick. However, I find the material to be far too soft, and thus the tone is dull. Adding my own bevel, just thinned the body out of the pick, rather than adding brightness. V-Pick: I tried several, and they never had enough warmth or body, and depending on the tip shape they could be entirely shrill. Alternative Natural Materials: horn, rock, wood, bone - all were either too hard and shrill, or too soft and dull. No good. John Pearse Fat Turtles: These come in three sizes, 1.2mm, 2.5mm and 4.0mm, but have a non-symmetrical shape and huge depression in the middle. The don't come with much a bevel, so I always found that I needed to add one in. But, aside from not being my perfect match, they are excellent, and if you add the right bevel, they are fat and warm without being dull. Standard Celluloid 351 Heavy: Believe it or not, a standard heavy guitar pick often sounds really good in this style. I found that the slighty "click" provided by the house -brand stringsandbeyond.com pick really added to the Charlie-ness of the tone. Similarly, the standard Fender sounded excellent on my Eastman. The weakness is, of course, flexibility. Because of their relative thinness (compared to a 2mm-5mm pick), they only really worked for me in quiet settings, like playing at home. 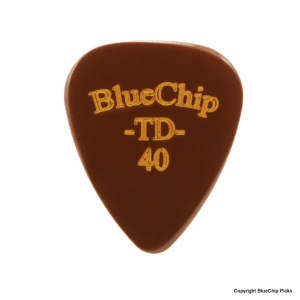 Blue Chip TD40: (1mm) I was killing some time in a music-store in Boulder, CO, and the owner ended up being really helpful about recommending a place where I could rent a suitable amp. I felt bad I'd taken up so much of his time, and was trying to find something I could buy, but he didn't carry my preferred string brands. He just happened to carry these, and despite being pretty damn expensive, he was cool with me playing it for a second first. I have to say that it was the best feeling pick I've ever played. The bevel is perfect and the tone produced on my Eastman is ideal. I never have to think about it, and it just feels right. My execution is more exact, and I can play things I might not otherwise be able to pull off. The only down side is that it is a touch to bright/twangy for my ES-150/EH-185 combo - as a result of hearing that twanginess, some of my standard lines sound more "western" than "swing", and while I dig that kind of thing, it's not what I'm trying to do in the Campus Five. Last bonus, I've been playing one consistently for months and there is little to no wear apparent. Just don't loose it! Wegen 1.2mm AND1.4mm: I keep both of these around, the heavier one for playing my LeVoi, and the lighter one as an all purpose back up. Django-type guitars often need a bit thicker/rounder pick to add body, and the 1.4mm has a good balance of tone for my guitar. The 1.2m sounds good on all the guitars, and has less give when I need to play hard, so if I'm struggling and my pick isn't helping out, I'll switch to the 1.2mm. That said, at that thinness, the softness of the material becomes apparent, and sometimes there can be "feathering", burs of the material become raised and have to filed off. 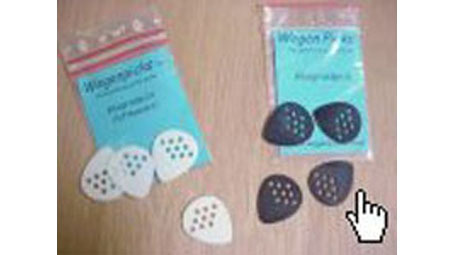 JB Picks 1.5mm RB: I quite like all of the options of JB Picks, and they're actually pretty reasonably priced. The 1mm sounds wonderful on my Eastman at home, and they're all around good picks in a nice faux-tortoise. The "twang" problem on my ES-150 is perfectly remedied by the fatness of the thicker 1.5mm with the default rounded bevel. 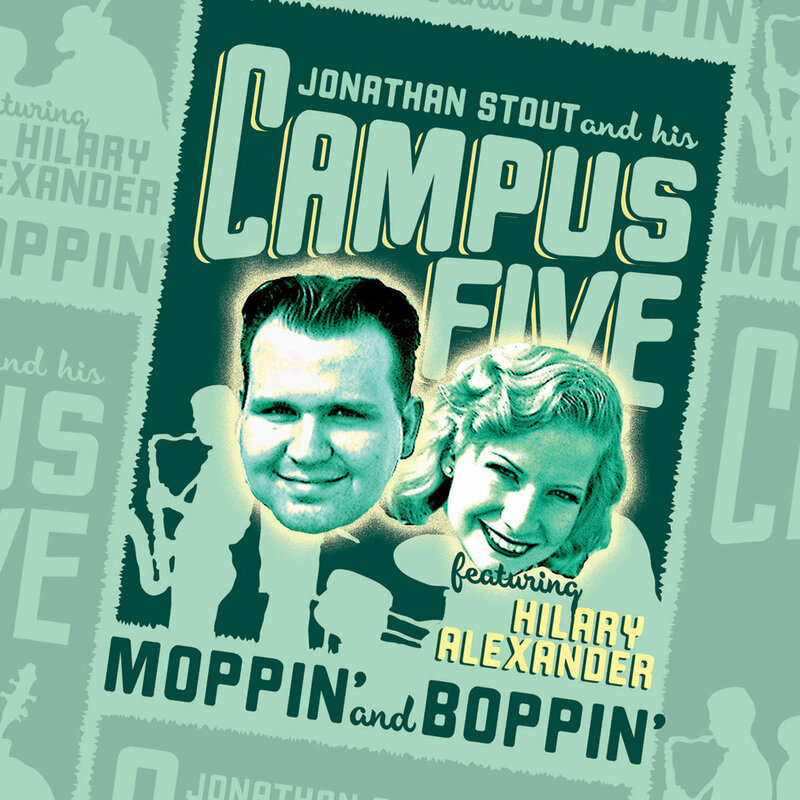 The round bevel also contributes a welcome "click" to the attack that is reminiscent of Charlie. All that work, and I still have to carry around FOUR different picks. Of course, I still find myself vacillating back and forth between some of the options. Especially with the JBs because there are 1mm, 1.2mm and 1.5mm sizes with optional bevels. Sometimes, the brightness of the bevel is nice, but sometimes it's too much. I've been experimenting with the slightly thicker TD50 (1.25mm) on my ES-150 hoping for a bit more body. Perhaps I need to go all the way the ~1.5mm TD60. Oh - when does it end?! But seriously, I think there's a lot of great options in picks, but you really have to find what works best for your instrument, set up, strings, etc, and just what sounds and feels good in your hands. I doubt you could go wrong with my all-purpose pick of a 1.2mm Wegen, or the Blue Chip TD40 on an archtop. They're both great, and the line of JB picks is reasonably priced enough that you can experiment a bit with out spending a ton per pick.